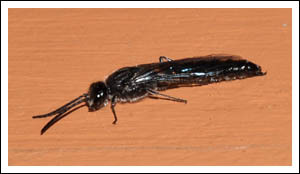 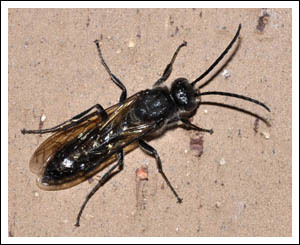 An unwelcome component of the garden ecosystem can be the European earwig, often found under loose bark and in cracks and crevices in large numbers. 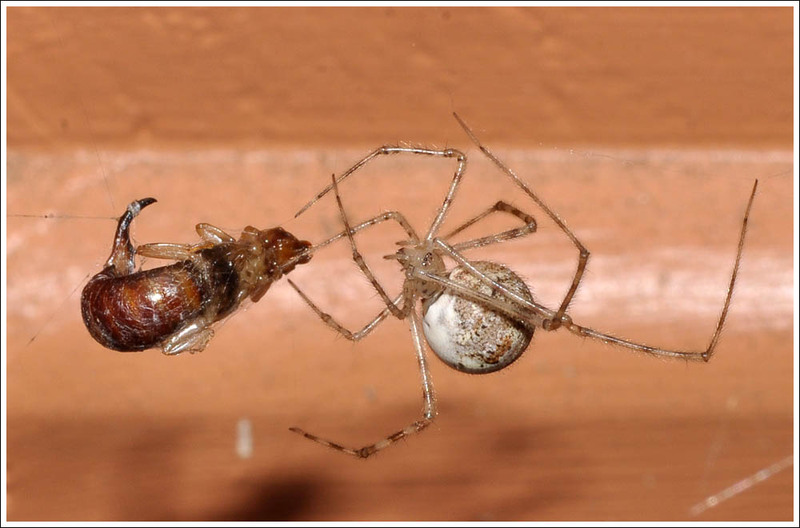 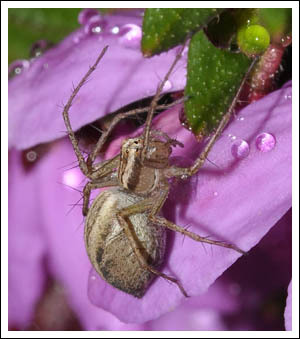 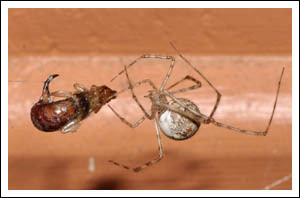 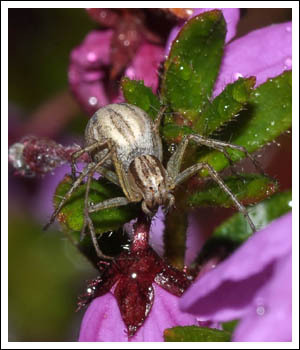 This one came to a sticky end in the web of a Theridiid house spider. 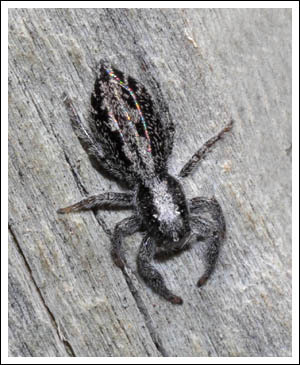 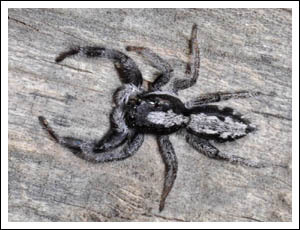 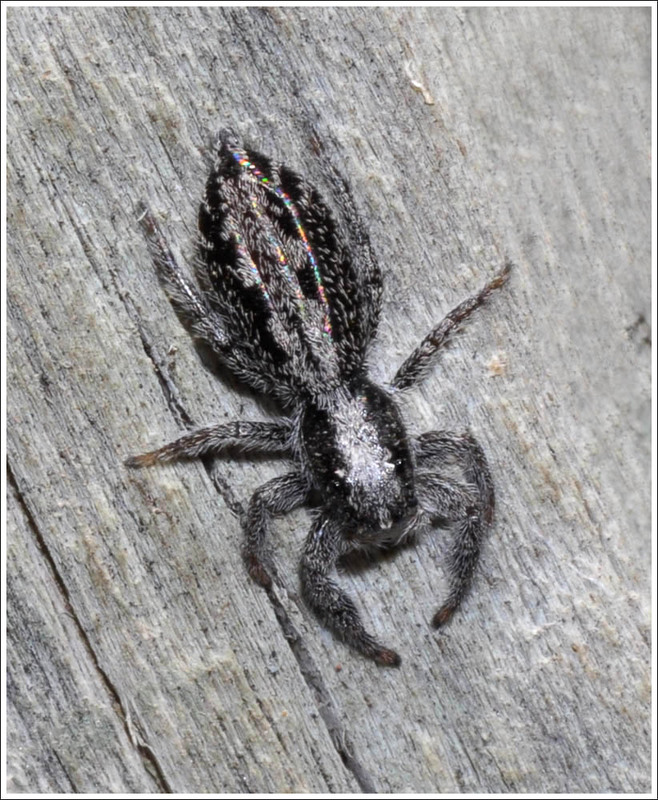 Jumping spiders in search of prey roam the walls of the house and break-wind fences, this Ocrisiona species favours the latter. Following the hot day mentioned in the previous post, thunderstorms with rain showers swept through. 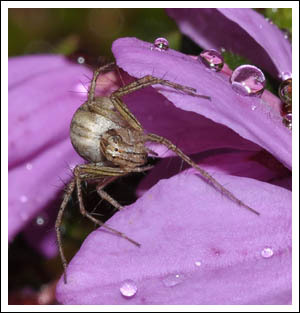 Next morning the garden was refreshed and insect life was abundant. 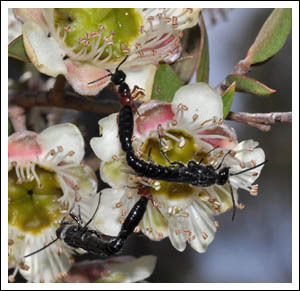 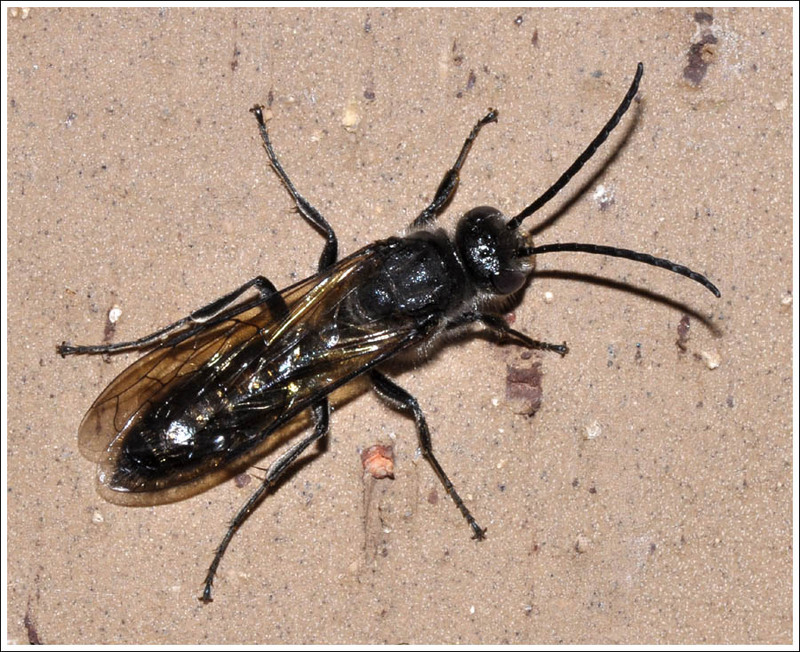 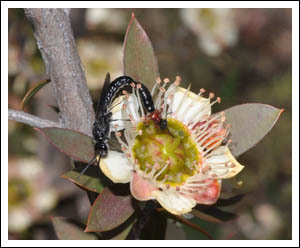 The Leptospermum macrocarpum was a magnet for mating wasps, with the males taking the wingless females to the flowers for them to feed on nectar prior to laying their eggs. 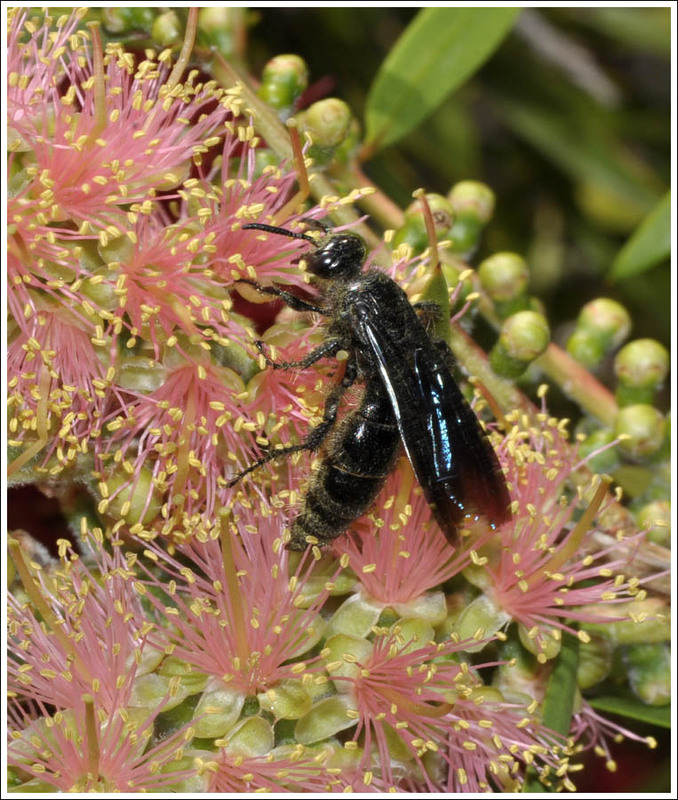 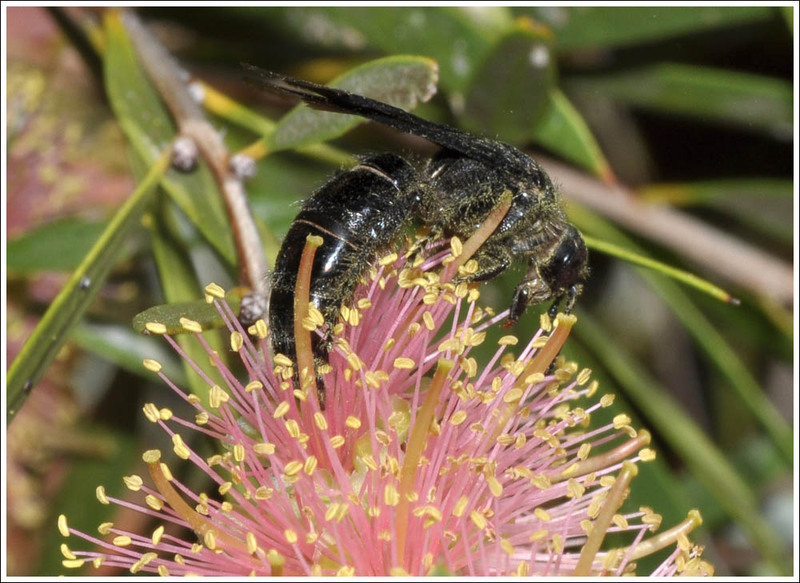 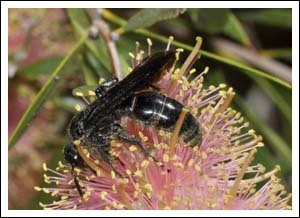 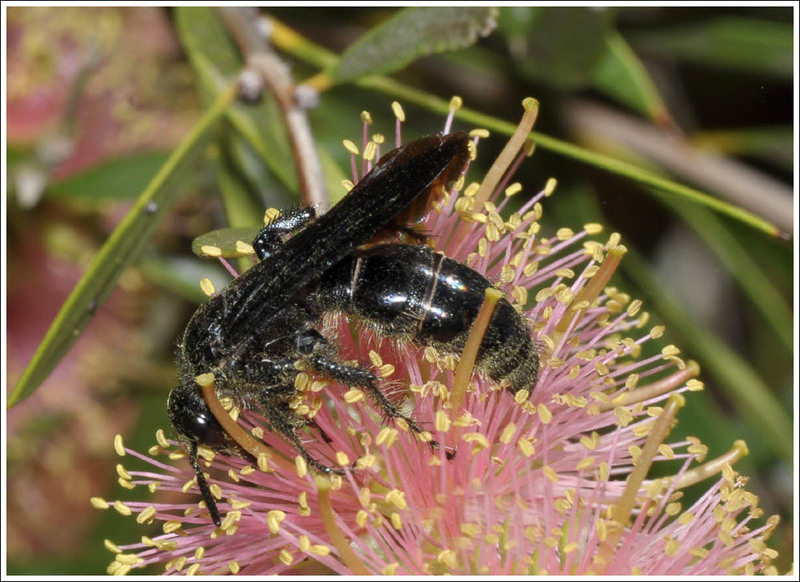 The Callistemon sieberi on the other hand attracted numbers of the spectacular blue/black flower wasp, Scolia soror. 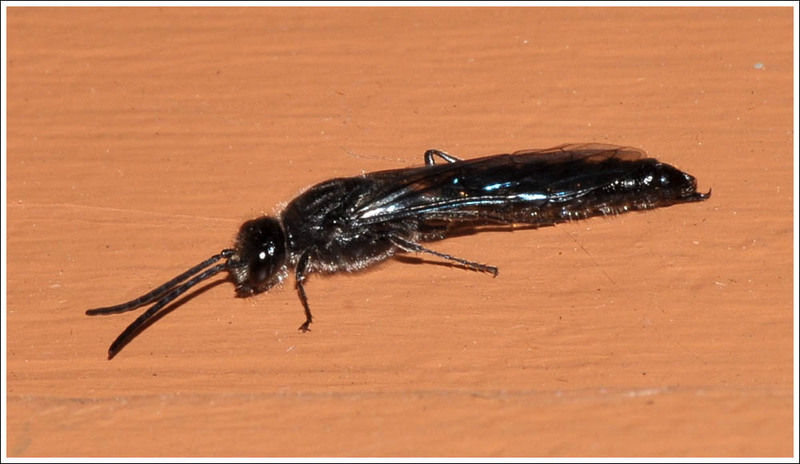 Unfortunately due to the need to use flash to freeze their movement, the blue sheen on the wings was nearly impossible to capture. 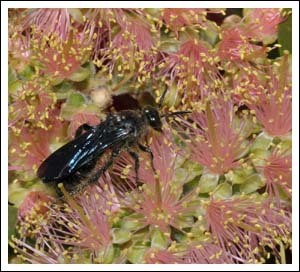 They are obviously efficient pollinators. 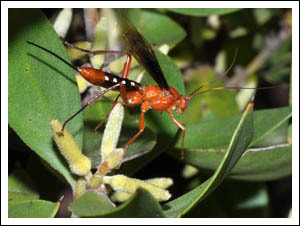 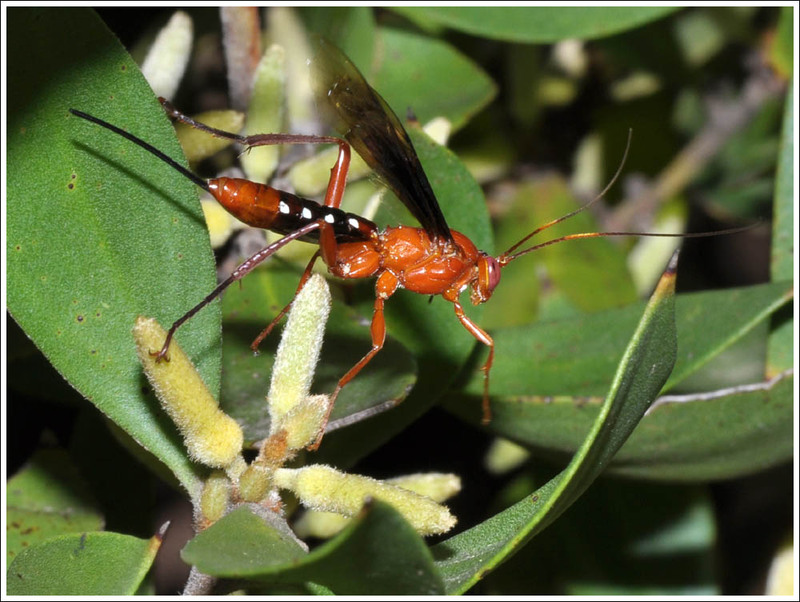 This Ichneumon wasp, Lissopimpla excelsa however was interested in the Persoonia cornifolia. Posted on November 24, 2017 November 24, 2017 by TricarpaPosted in General Nature. 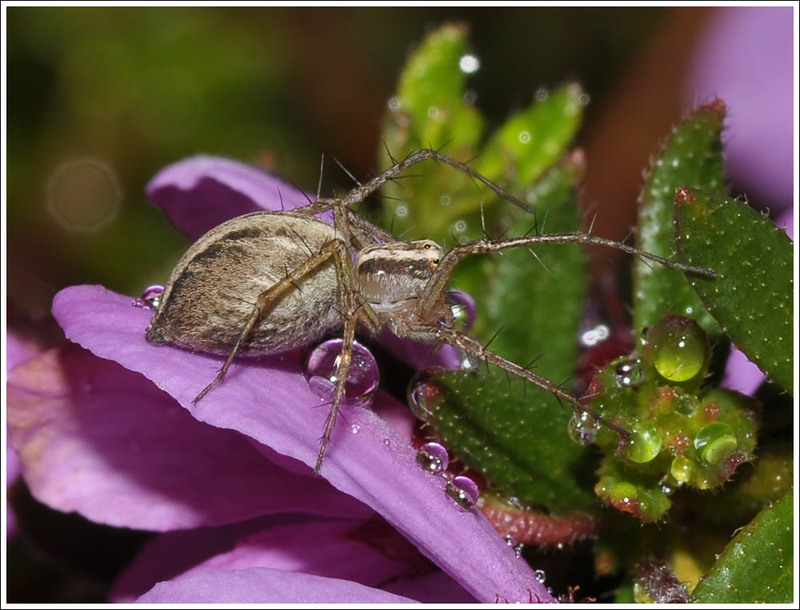 As the name of this post suggests, a garden can be a diverse and thriving ecosystem, and the next posts will illustrate some of that diversity. Tetratheca thymifolia has been a very successful plant in a raised bed, never without flowers that attract a range of creatures, eg. this tiny lynx spider lurking in the beauty waiting for a meal. 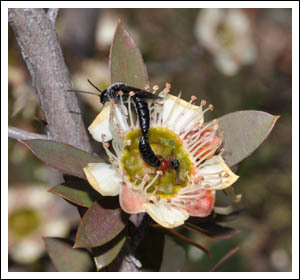 Leptospermums are a rich source of nectar for many insects, every year among the first to sample the rotundifolium sweetness is an admiral butterfly. 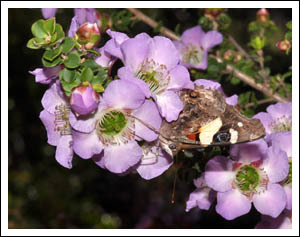 The house is part of the ecosystem, and is utilised by many invertebrates. 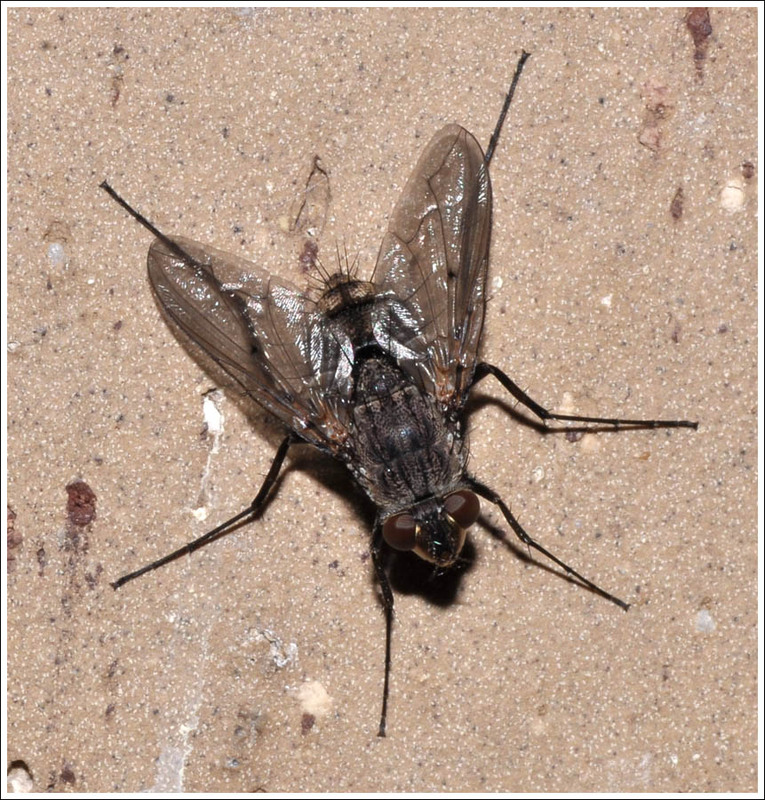 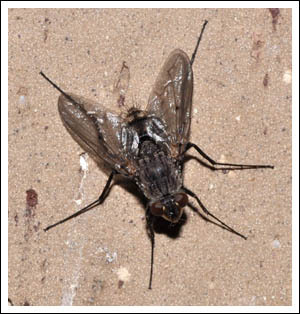 On the first hot day to arrive as we approach summer, tachinid flies and wasps found the coolness of the walls offered respite from the heat. 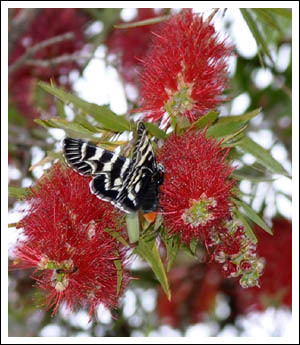 A Mistletoe Moth, Comocrus behri found the Callistemon viminalis a good nectar source. 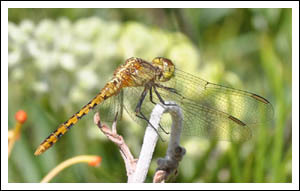 Black-faced Perchers, Diplacodes melanopsis are regular in the garden at this time of year, and as time goes by will gradually attain their distinctive colour. Posted on November 19, 2017 November 19, 2017 by TricarpaPosted in General Nature.